Ride is good, not as comfortable as the marvelous 428i that I drove last year, but then it rides on a 110.6-inch wheelbase compared with 105.9 inches in the 2 Series. Five inches goes a long way to smoothing rough roads. Still, as in the 4 Series, the M235i mates the superbly designed suspension with BMW’s Driving Dynamics Control system that adjusts the chassis and modulates the engine’s power curve too. Set the DDC on Eco, you get lowered power and a somewhat more pedestrian chassis feel. Move to Comfort and you’ve dialed in the best ride for southeast Wisconsin’s crumbling roads. The DDC also has Sport and Sport + settings that noticeably bump the torque and firm the ride and steering feel. In fact, cruising in Comfort and pushing the console-mounted DDC button will immediately crank up engine revs in Sport. I suggest the Sport + setting mainly for race courses. 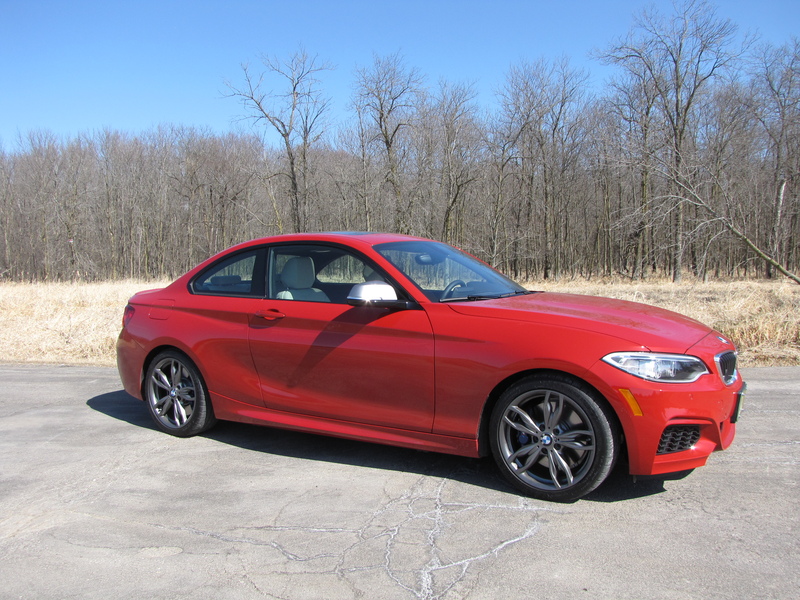 The xDrive gives the M235i great all-wheel grip along with traction and stability control. That helps keep the driver from spinning wheels in the wet or getting squirrelly if the gas is applied too early exiting a turn or catching a little gravel that’s been tossed onto a roadway. This model comes with R18 tires standard too. 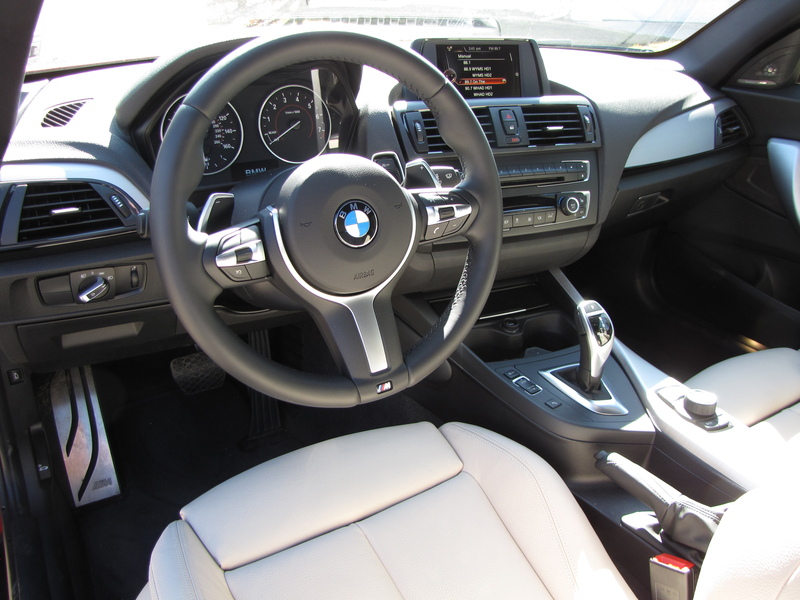 Shifting comes via an 8-speed Sport automatic, which means you can slip it into manual mode and choose your own shift points, either via the console shifter or paddle shifters behind the wheel. But the automatic does a sterling job on its own. 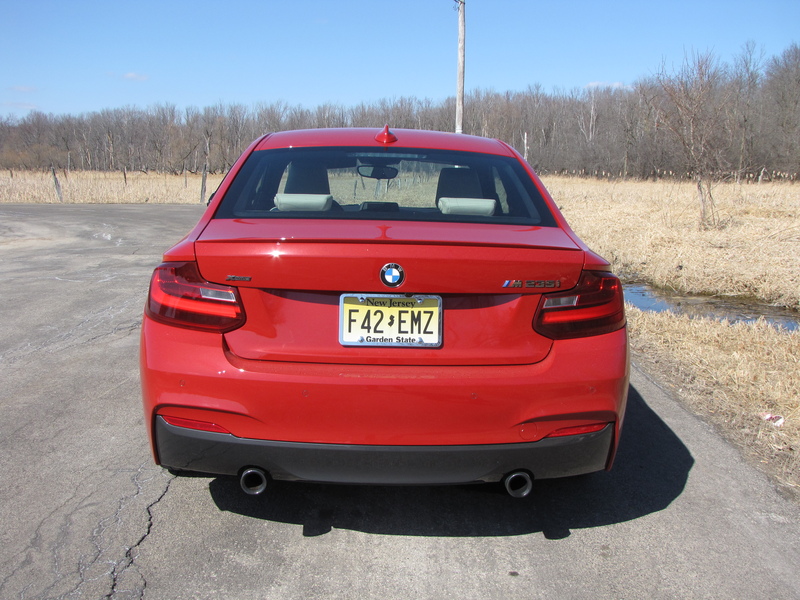 While the M235i’s interior is handsome and comfortable with a racy edge, there is a fair amount of road and tire noise. That may be fine for buyers wanting the racier feel and a sound that matches. Be assured this coupe leans way further toward performance than luxury. That’s not to say its interior isn’t darned nice. The Melbourne Red (bright red and $550 extra) test car featured what BMW calls an Oyster Dakota leather interior that adds $1,450 to the sticker. I interpret that as creamy gray leather seats, arm rests and door inserts while the dash is a thickly textured black material that feels a bit rubbery, but looks great. Trim is brushed silver on the door pulls, dash and console. Seats are well formed and feature power adjustable bolsters and lumbar and a manual lower cushion extension that long-legged drivers will appreciate. Both front seats include full power adjustment, finally parity for passengers! The seats also have a release atop the seat back to flip the seat forward and allow easier access to the somewhat cramped rear seat. Another button allows a passenger to power the seat up and back to simplify entry or exit. Sadly, as well shaped and adjustable as the seats are, the seatbelts are fixed into the B pillar and can’t be moved up or down. Reaching back to find the belts is a struggle. Seats are quite comfy and highly adjustable, while the radio is a pain in the patoot! While I don’t mind not having a navigation system, I suspect some folks will expect it at the M235i’s price. They also might expect an awesome stereo that’s easy to tune. Well, the test car fulfills half that wish with a harman/kardon stereo that sounds great and adds $875 to the tally. But it’s hindered by a clumsy tuning system that despite seven channel pre-set buttons on the dash is primarily tuned via a dial on the console; not intuitive at all and way too complicated to use while driving. This needs improvement. On the plus side the dash is well laid out and easy to see and understand. There’s a dual climate control system and each front seat has three heat settings, a $500 option. There’s an SOS system overhead for road emergencies and a sunroof. Visors are hard plastic and do not slide or extend, again odd at this price, and there was no heated steering wheel. A driver assistance package that costs $950 added a rear-view camera and park distance control, something you might expect to be standard at the car’s $44,900 base price. 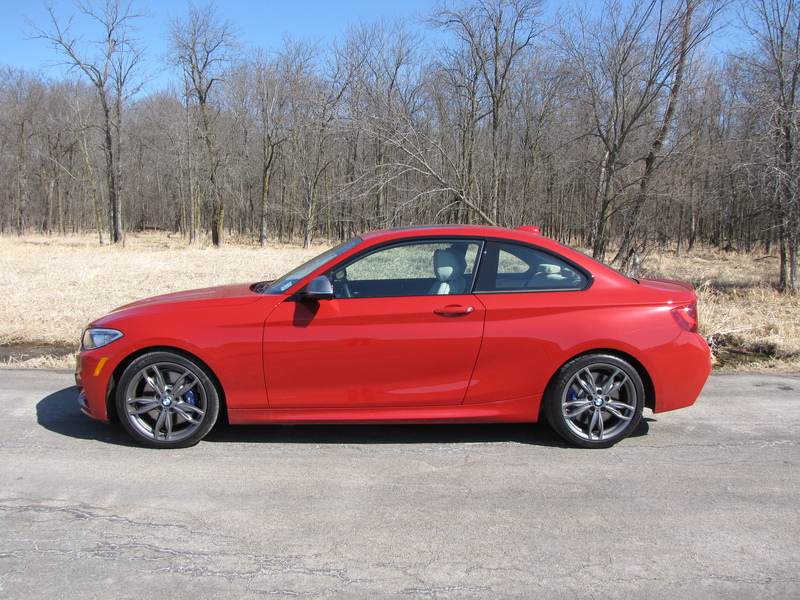 Delivery is $950 and with all its options, this M235i hit $50,175. Gas mileage (yes it requires 91-octane premium) is reasonable for such a powerful car at 20 mpg city and 30 mpg highway according to the EPA. I got 22.0 mpg in about 60% city driving. 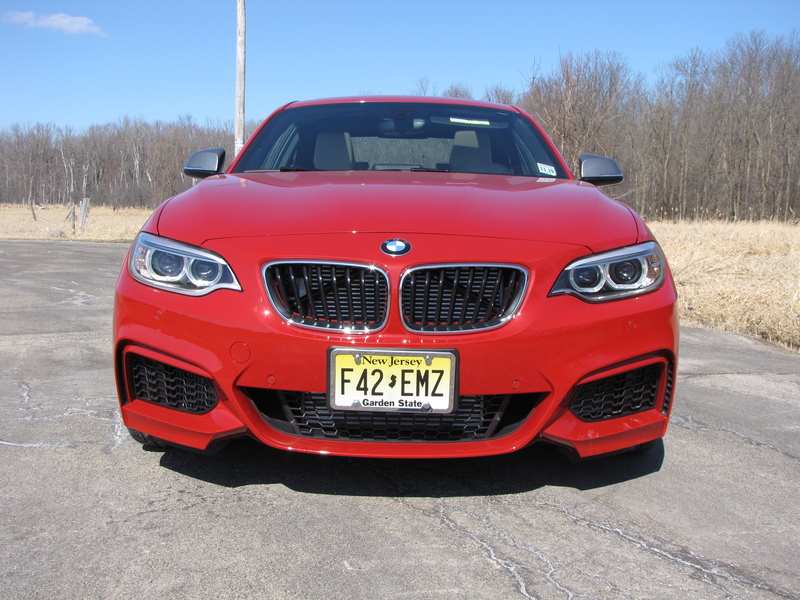 Still, at its entry-level pricing and with few options the 228i would be a blast, and the M235i is a certifiable racer at the $45 grand entry price. But once you hit $50 grand I’d opt for the longer and more comfortable 4 Series in a heartbeat. Hits: Extremely responsive handling, racer-like power, good ride, four ride/shift settings, and all-wheel drive. Well-formed seats with adjustable bolsters, sunroof, SOS system, harman/kardon stereo and heated seats. Misses: Price, fair amount of road/tire noise, hard to reach seatbelts, no navigation and complicated radio system that’s hard to adjust while driving.